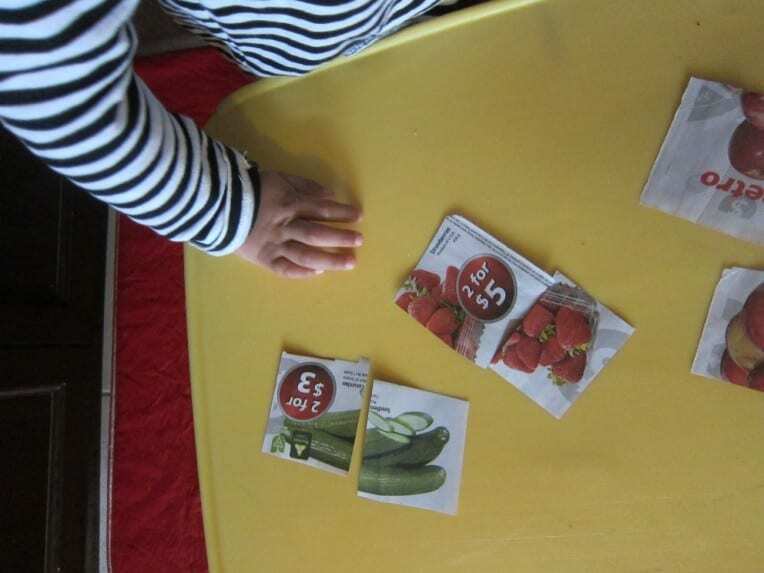 Our toddlers love playing with puzzles and have mastered all the ones we have at home for ages 1.5 and up. Lately I’ve been trying to find more challenging puzzles for them but it’s tricky to find ones that are not too easy and not too hard. I’ve tried puzzles with Thomas the Train and Minnie Mouse, but each of those came with 24 pieces which was too frustrating because they could not get the ‘big picture’. A simple 2 piece puzzle from the Dollar Store allowed them to match the top and bottom pieces together to form a tractor. 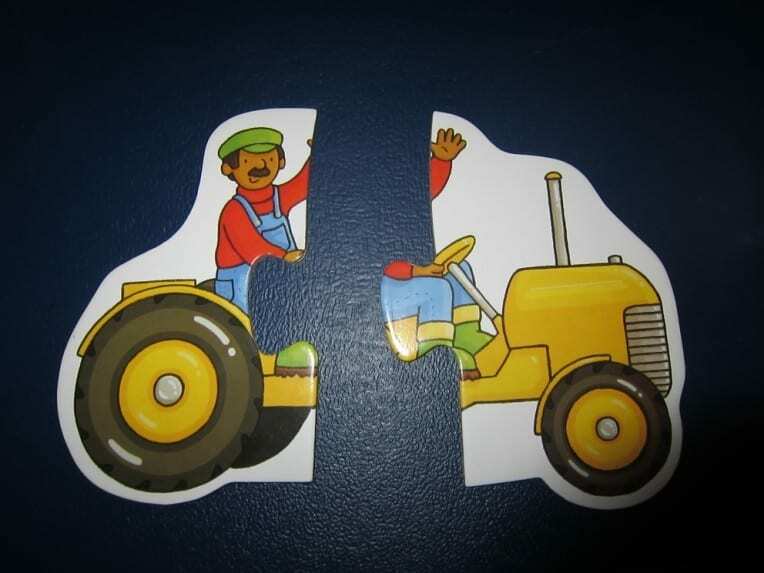 That tractor puzzle quickly became a toy for Mister until it split back into two pieces. Hmmm…how do I show them the concept of what a puzzle is and help them to see how all the pieces fit together? The answer is simple: make your own puzzles! There are different ways to do it. You could take a printout of their favourite character (like Elmo, for example), cut it up in a few large pieces and get them to put Elmo back together again! Or instead of using paper, try cutting up shapes in pieces of felt and have your little one match up the colours. I didn’t have a cute printout or felt handy, but I did have a grocery flyer with pictures of fruits and vegetables. I experimented on Missy and she enjoyed putting together the basket of strawberries and matching up the cucumbers. Who doesn’t like looking at pictures of food? This is a basic activity you can do when your little ones are in need of a distraction. A word of caution if you use pictures from flyers.. the ink is not good for little mouths! I think this is brilliant, and so easy! Great for kids that conquer puzzles quickly and then bore of them. I am thinking printed photos of the kids’ cousins, glued onto bristol board.. This is a great idea for a fun activity and so easy to change up to keep it interesting!